Our 5 day (or weekend Splitter) Foundation Bricklaying Courses at The Builder Training Centre are very practical and ‘hands-on’ courses, and are ideal for beginners looking to learn bricklaying for DIY or handyman skills, experienced people looking to extend their trade skills or perfect their bricklaying skills, or those looking for a new career as a bricklayer. The Builder Training Centre (The BTC) offers high quality structured Bricklaying Courses, which can be attended as a 5 day course during the week (Monday to Friday) or, for those that have commitments during the week, a weekend course (2 consecutive weekends). Our instructors are qualified, highly experienced, knowledgeable and enthusiastic Tradespersons, so students can take advantage of all the tips of the trade, personal experiences and advice they offer. This short course is intensive, but the atmosphere is relaxed and enjoyable which creates a good learning environment. If you have a particular project in mind, or some building plans you wish to gain advice on, our instructors will be more than happy to discuss these with you. You will get dirty so you should bring working clothes. We have changing room facilities for men and women! You will find our prices are competitive, and include the use of tools and materials for your Bricklaying Course whilst you are here, but for health and safety reasons you are required to have steel toe capped footwear to wear throughout the course. These can be purchased from reception on your first morning for £20 if required. Full instruction will be provided in the use of bricklaying tools, and a wide selection of tools will be available for purchase from reception at any time during or after your course. 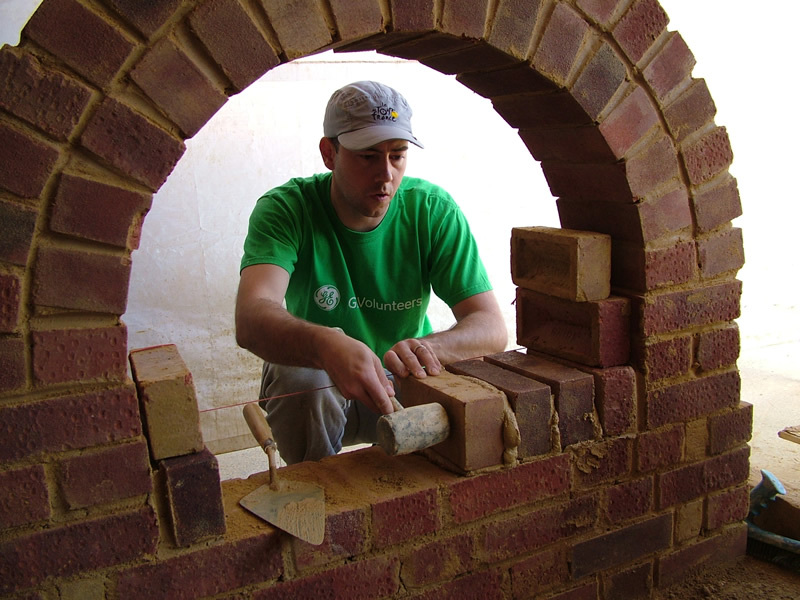 This practical Bricklaying Course is set out to enable you to learn the skills of bricklaying. The course will give you as many bricklaying skills as possible. It will teach you everything from mixing mortar to pointing to being capable of building your walls plumb, vertical and square. You will learn different types of bond including Stretcher, English, Flemish, block-work, brick capping and arch construction. Skills learnt will culminate in the construction of a small extension. Fact sheets will be supplied on our Bricklaying Course, so there is no need for too many notes! After completing the Bricklaying Training Course you will receive a Builder Training Centre Certificate of Continuous Professional Development. Full payment or a deposit of £150 is required to book a Foundation Bricklaying Course. Any remaining balance can then be paid at any time before the start of the course, including the first morning. Total £1,425.00 (inc VAT). A saving of £125.00! You are welcome to visit The Builder Training Centre at any time during opening hours (8.00 am until 5.30 pm) either during the week or at weekends to see our facilities first hand. No appointment is required and you will be made very welcome.Why not come and meet our bricklaying instructors and speak to our bricklaying students and see for yourself what you can achieve from each course? We are confident that you will like what you see and will want to learn basic bricklaying with The Builder Training Centre. All our bricklaying courses are held at our training centre in Surrey, Greater London.